Happy January, everyone! It is a time for new beginnings – resolutions to get in shape, be better people, and help change the world for the better. This time of year inspires people to be their best selves. I like this time of year because January is the best time to start using all the fabulous new gadgets you got for the holidays! This year, my sister (E) and I decided to throw practicality to the wind and get my parents an ice cream maker. This decision also stemmed from the fact that Crate and Barrel discontinued our family’s “everyday mugs” (our awesome, original gift idea) – we decided that instead of purchasing my parents a whole new set of coffee mugs, an ice cream maker would benefit us more. It also looked really cool. My parents were not as excited about our gift at first; but as they began to use it, they became excited with the prospect of making a sweet treat in the comfort of our own home. I personally entered the 21st century by treating myself to a fancy new camera. It was so exciting to get a camera that could take lovely close-up pictures, especially when it came to photographing food. I tested my camera’s new skills by taking hundreds of pictures of the ice cream we made with the brand new ice cream maker – food never photographed this well on my iPhone (but that be from when I dropped it into frosting that one time…). 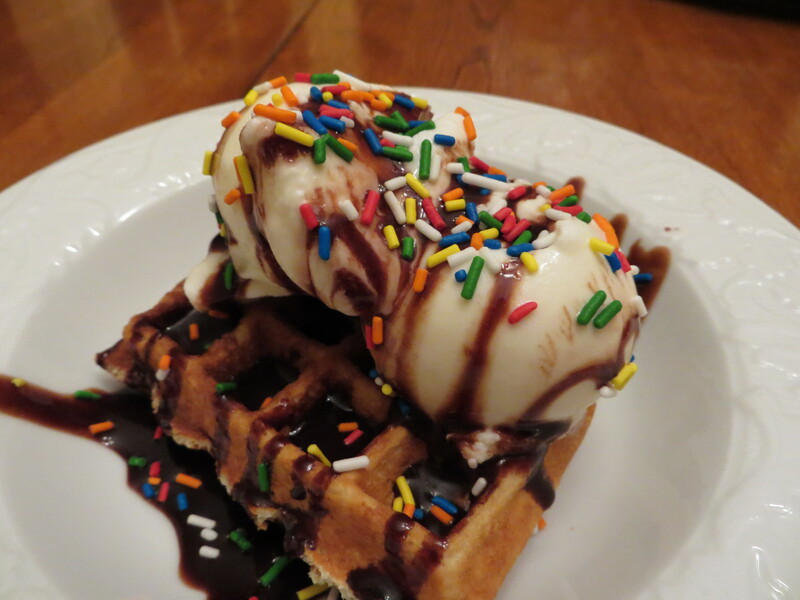 This is my dessert magnum opus – a lovely, homemade Belgium waffle topped with homemade vanilla ice cream, copious amounts of chocolate syrup, and enough rainbow sprinkles to cover every surface. It was the best thing I had ever eaten. 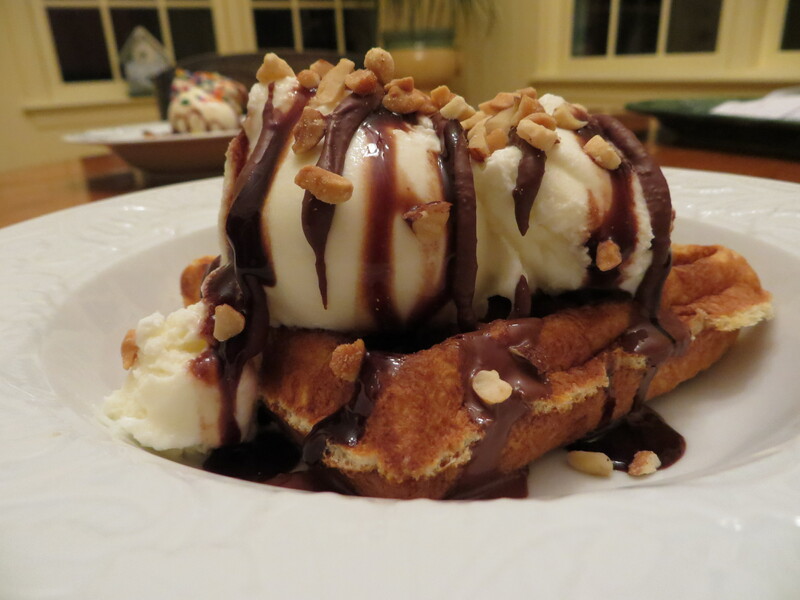 E also made a waffle sundae with vanilla ice cream, but she used chocolate syrup, chocolate-peanut butter hard shell syrup, and chopped nuts to top it off. A perfect blend of salty and sweet. The ice cream maker (and my camera) provided endless family fun and entertainment for the last two weeks of winter break. The “together time” was the best way to begin a new year – it reminded me that family is the foundation on which everything is built, especially when it comes to food. May your year be happy, healthful, and amazing!